Hello! It's Robin Redd here with you today. Welcome to day 10 of The 30 Days of Christmas. I made a simple Christmas card, for you, that has a ton of Christmas PUNCH! With this stamped I used the tone on tone method to stamp the background. you are stamping it on. 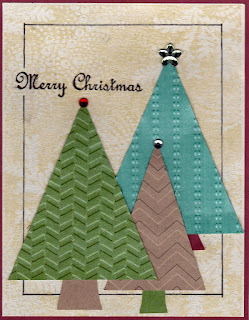 To make the trees, simply cut triangles from your choice of cardstock or paper. You can use ANY (well, just about) embossing folder you have on hand to 'decorate' your trees.